Objective: To determine that remote robotic telepresence can be used to evaluate and train surgical residents and medical students in the fundamentals of laparoscopic surgery (FLS). This project is a precursor to providing real time intraoperative video tele-consultation to surgeons deployed in remote areas in support of the Global War on Terorism. 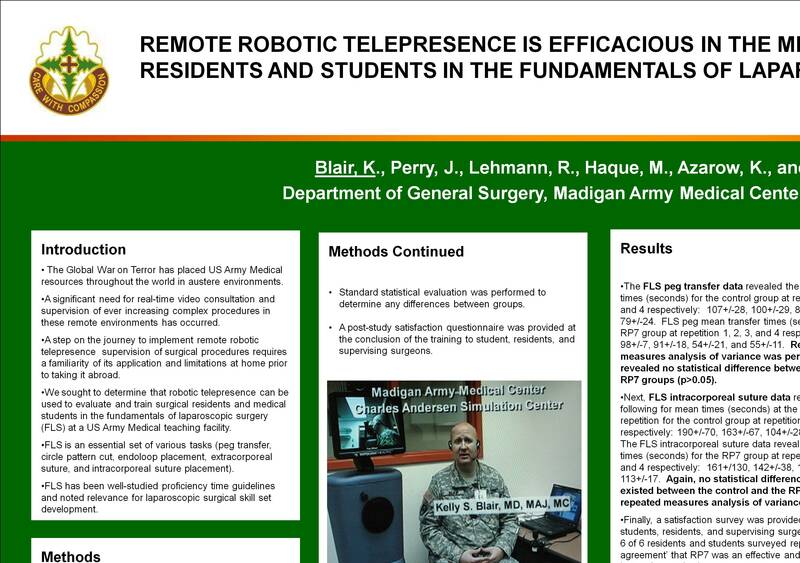 Methods: A control group of 15 and a robotic telepresence study group of 6 surgical residents and medical students underwent training and evaluation in FLS. FLS is an essential set of various tasks (peg transfer, circle pattern cut, endoloop placement, extracorporeal suture, and intracorporeal suture placement) with well studied proficiency time guidelines and noted relevance for laparoscopic surgical skill set development. Subjects viewed a live demonstration by a board-certified general surgeon of the 5 FLS tasks either in person or via robotic telepresence using the Remote Presence 7 (RP7) robot by In Touch Health. Instruction and data acquisition of the time to complete FLS tasks were recorded by the supervising surgeon. Subjects with prior FLS experience were eliminated from analysis. Standard statistical evaluation was performed to determine any differences between groups. A post-study satisfaction questionnaire was provided at the conclusion of the training to student, residents, and supervising surgeons. Results: The FLS peg transfer data revealed the following mean times (seconds) for the control group at repetition 1, 2, 3, and 4 respectively: 107+/-28, 100+/-29, 88+/-21, and 79+/-24. FLS peg mean transfer times (seconds) for the RP7 group at repetition 1, 2, 3, and 4 respectively were 98+/-7, 91+/-18, 54+/-21, and 55+/-11. Repeated measures analysis of variance was performed and revealed no statistical difference between control and RP7 groups (p>0.05). Next, FLS intracorporeal suture data revealed the following for mean times (seconds) at the denoted repetition for the control group at repetition 1, 2, 3, and 4 respectively: 190+/-70, 163+/-67, 104+/-28, and 78+/-11. The FLS intracorporeal suture data revealed the mean times (seconds) for the RP7 group at repetition 1, 2, 3, and 4 respectively: 161+/130, 142+/-38, 124+/-29, and 113+/-17. Again, no statistical difference (p>0.05) existed between the control and the RP7 groups by repeated measures analysis of variance. Finally, a satisfaction survey was provided to medical students, residents, and supervising surgeons. All of the 6 of 6 residents and students surveyed reported ‘strong agreement’ that RP7 was an effective and interactive instruction method. The 2 of 2 supervising surgeon surveyed reported ‘strong agreement’ that RP7 was an effective means to supervise and train students and residents and saved time in travel to and from the training site. Conclusion: Remote robotic telepresence appears to be equivalent to in-person supervision, training, and evaluation with regards to the fundamentals of laparoscopic surgery training. Students and residents expressed more than satisfactory learning with both types of training. The supervising examiners noted a restriction on data acquisition with the remote robotic telepresence because only one subject could be evaluated at a time. In short, remote robotic telepresence offers an efficacious method for supervision of surgical based procedures.